In 2015 the first Airbus A350 XWB (that’s eXtra Wide Body) went into service. With its innovative design and use of exciting new technology, it soon had AvGeeks around the world turning cartwheels with excitement. Finnair was the first European airline to fly the new Airbus A350 and currently have 7 of them. 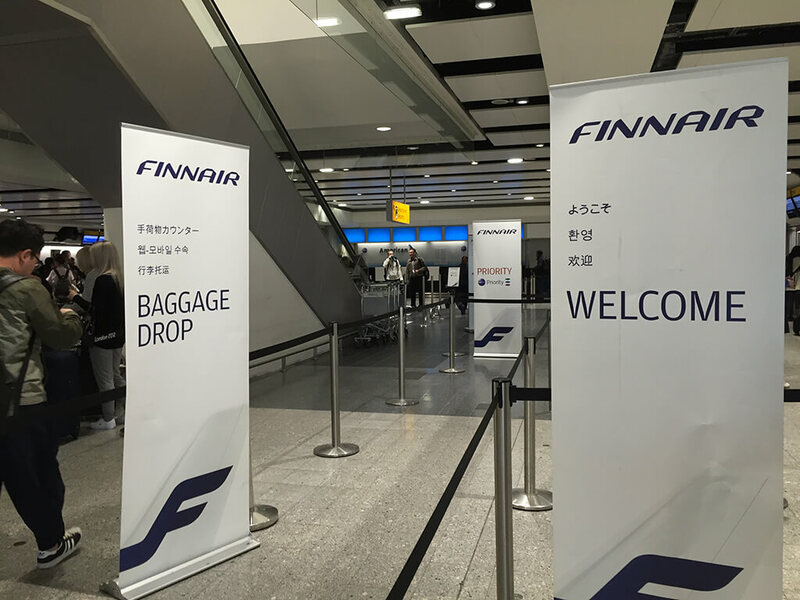 Designed for long-haul routes, Finnair is currently using them on some of their Heathrow to Helsinki flights. 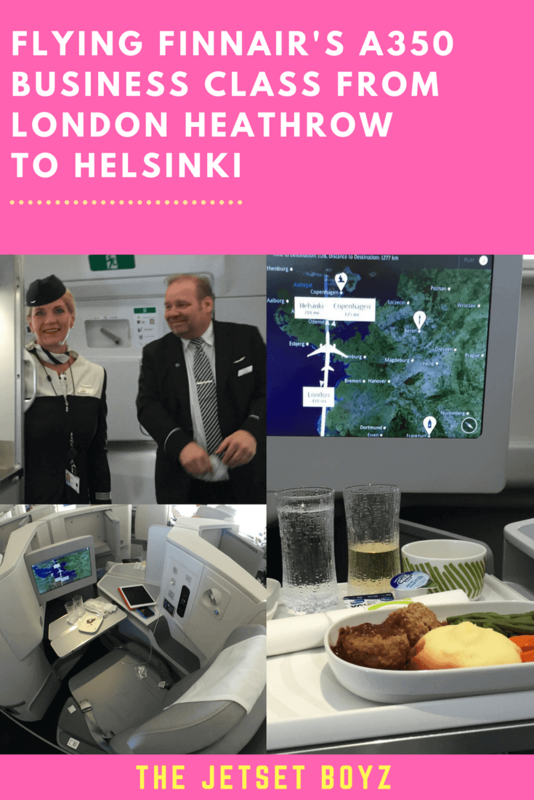 We used this as an opportunity to try out the Finnair A350 Business Class seats. 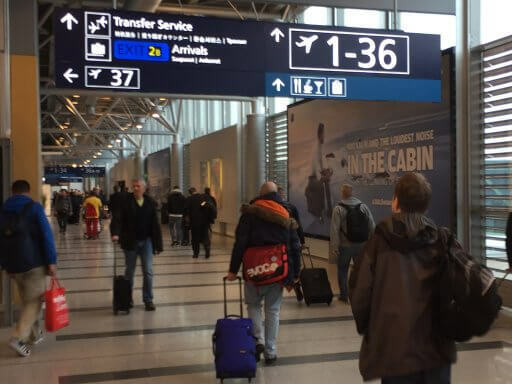 Rumours spread on frequent flyer forums that you could get a bargain priced ticket by flying from London to Tallinn in Estonia via Helsinki. 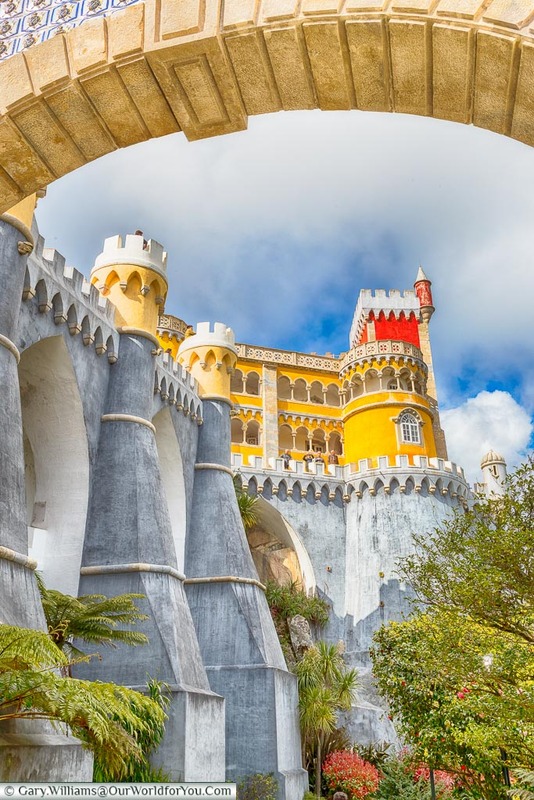 After a lot of searching, we were able to find the right combination of business class flights for just £276.70, booking on Expedia. So, that was our Finnair A350 Business Class flights sorted. Now it was time to dig out the thermal long-johns and trapper hats for 2 Days in Tallinn. 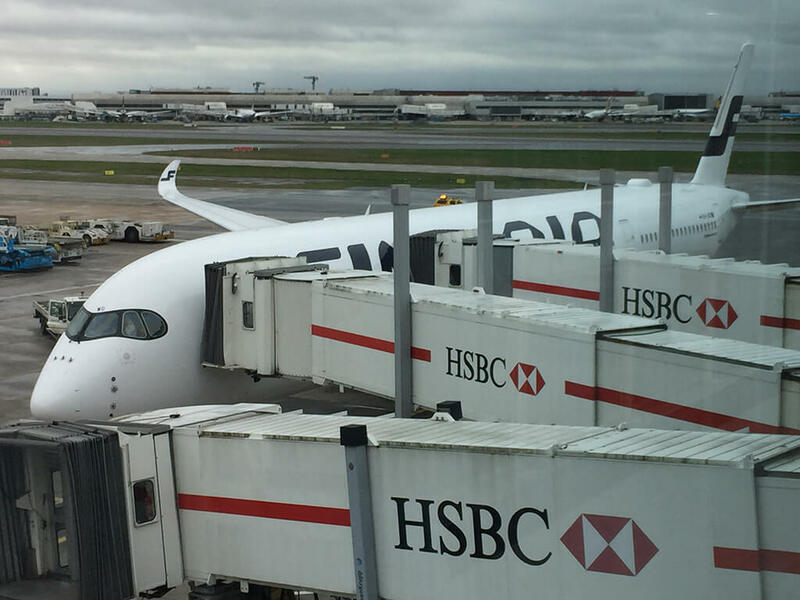 Finnair only operates the A350 on the Helsinki-London-Helsinki route on one rotation a day. The London to Helsinki flight departs Heathrow at 10:20am. We live on the other side of London to Heathrow. This means that getting there for a flight at that time involves getting up before the crack of dawn. To avoid this, we usually stay at the Hilton Garden Inn London Heathrow the night before a morning flight. After a good night’s sleep at the hotel, we only had a 5-minute walk and a 1-stop tube ride to get to the airport. All Finnair flights leave from Terminal 3, which is not my favourite terminal. We had checked in online using Finnair’s website, which opens 36 hours before departure. 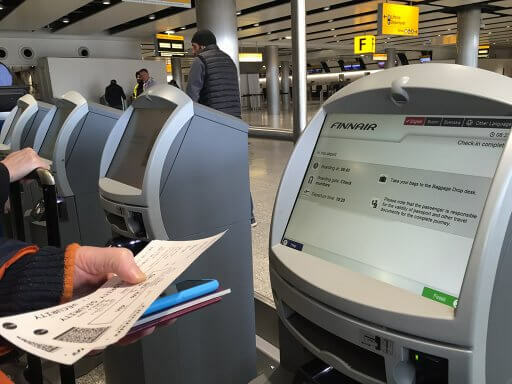 The check-in process was one of the smoothest online check-ins that we’ve ever done and other airlines could do well to try to follow their model. 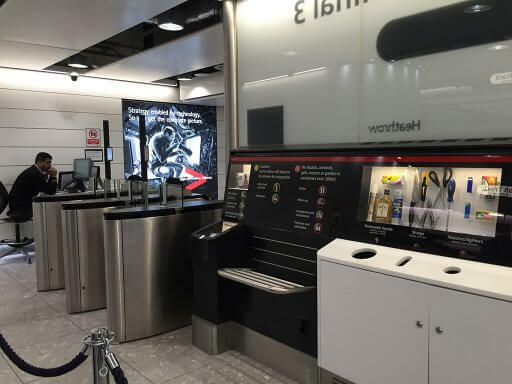 Had we chosen to check-in at Heathrow, there are 12 self-service check-in machines that also print bag tags. 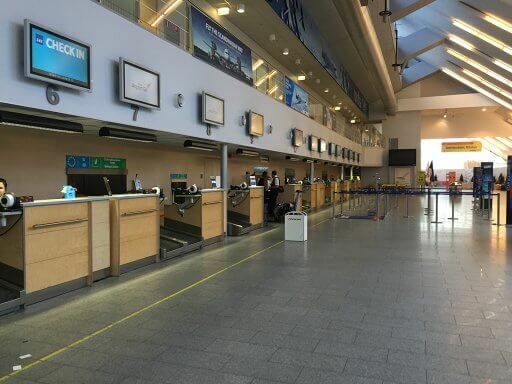 There are 4 check-in / bag-drop desks. 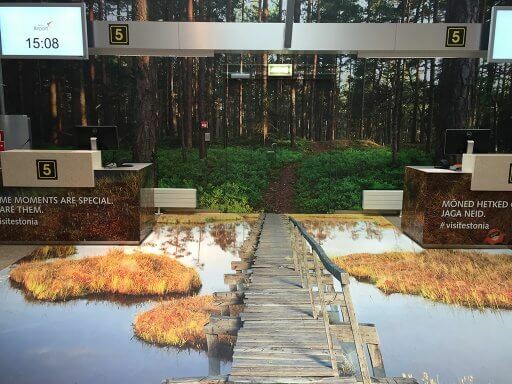 Originally, we intended to check our bags through to Tallinn. 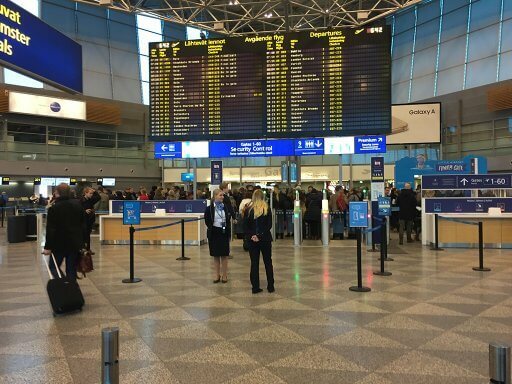 However, due to industrial action at Helsinki, there was no guarantee that our bags would make it onto our connecting flight. 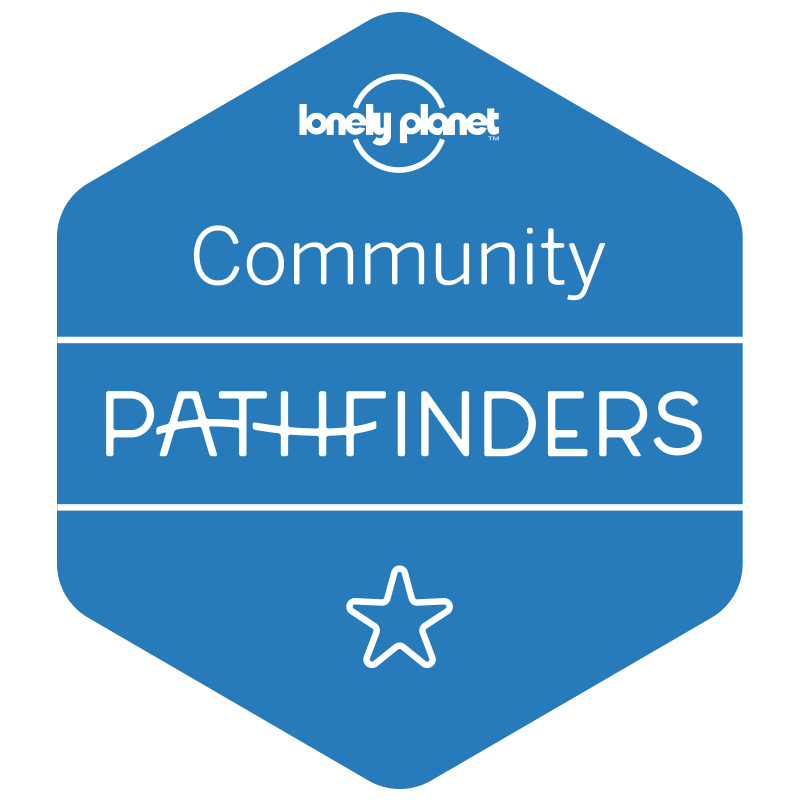 In the end, we decided to pack light and lug them with us. 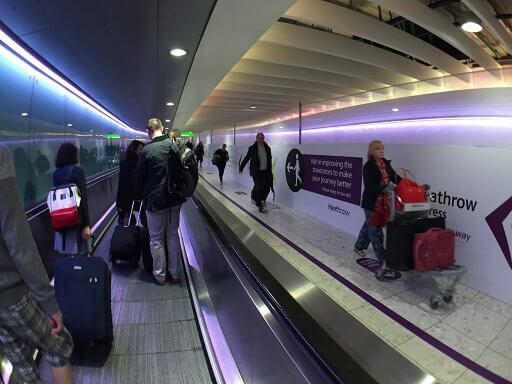 That meant that we could bypass bag-drop and go straight up to security. (Though we decided to print out some paper copies of the boarding passes for our scrapbook). Interestingly it had a VERY large print section telling you which boarding group you were in. 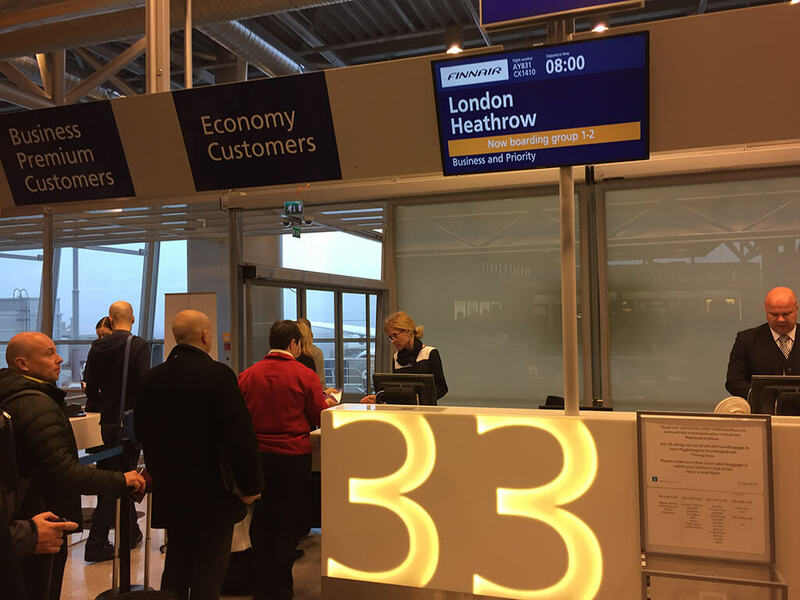 Paying for a premium cabin seat means that you get to miss out on the long queues at security and can scoot through priority screening. They’re pretty strict about only letting people who are eligible use it. We once got really angry watching an arrogant American guy barge his way to the front of the queue and demanded to be let through. Anger quickly turned to joy as he was told very firmly and very loudly that wasn’t entitled to use it. When he started to kick-off he was told to leave the area immediately or he wouldn’t be flying anywhere. At Heathrow, the official lounge for Finnair is the Cathay Pacific Lounge. 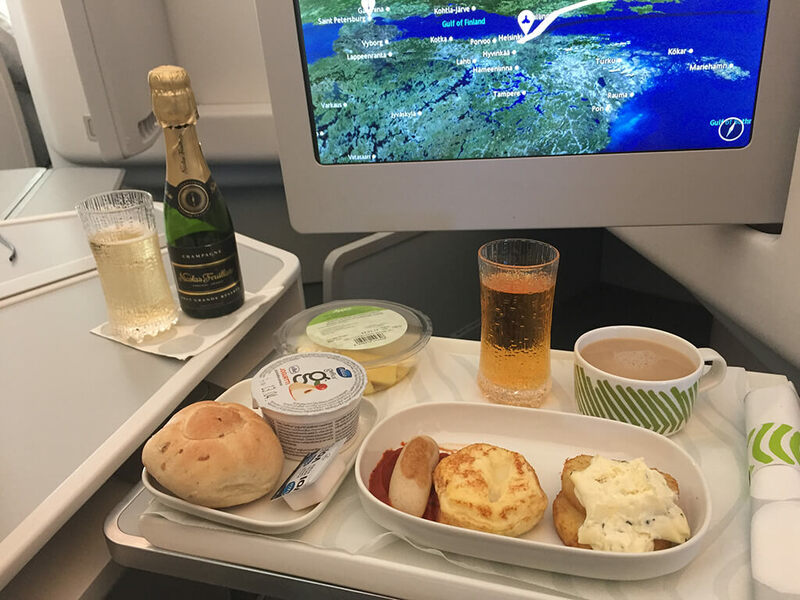 However, we noticed on our boarding passes for our Finnair A350 Business Class flight it said to use lounge F, the Number 1 Lounge. 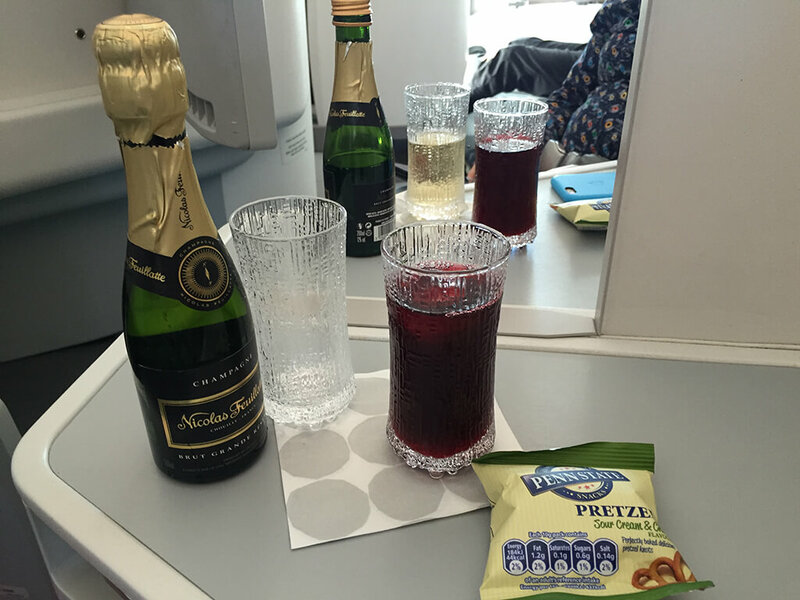 We had used the Cathay Pacific lounge for our flight to Vienna in December 2016 and liked it so much that we decided to go there again. Once again, the welcome was warm and friendly. The lounge was fairly busy on this occasion, but the staff were still managing to maintain the high standards we had seen in December. 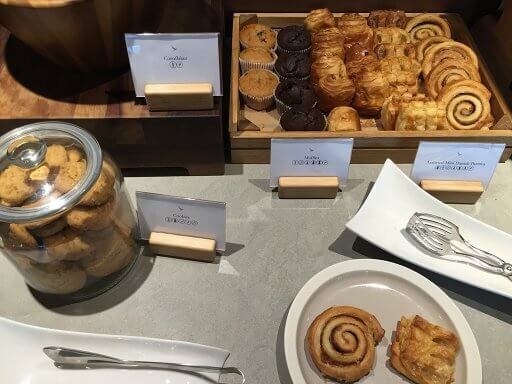 We had skipped breakfast at the hotel to try the offering in the lounge and we were not disappointed. The hot selection was tasty and the muffins were fantastic. After eating we chilled out with some coffee until a few minutes before boarding was due to start. Walking towards the gate we passed lounge F and realised how much closer to our gate it was than the Cathay lounge. 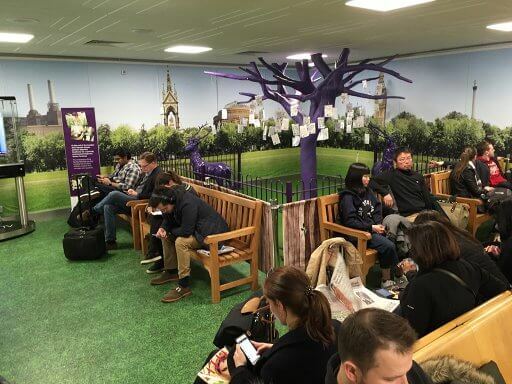 It made me wonder if they suggested the Number 1 lounge because it was nearer to the gate. The gate was announced on the screens at 09:20. We headed towards the gate at about half past nine, arriving just before 09:40. There was a slight bottleneck at the corner just before you enter the gate. However, the boarding agent was very efficiently directing people to the right queue. We had only been in the holding pen for about a minute when the gate agent made a very clear announcement that they were now starting to board people that had “boarding group 1” on their boarding pass. Boarding group 1 turned out to be Business Class and oneworld elites, so the majority of us in group 1 were turning left as we boarded. As I boarded a cabin crew member welcomed me aboard and asked for my seat number. I was then directed to the second aisle and to turn left, with a nice big smile. The first thing that hit me on walking into the cabin was how big it felt. 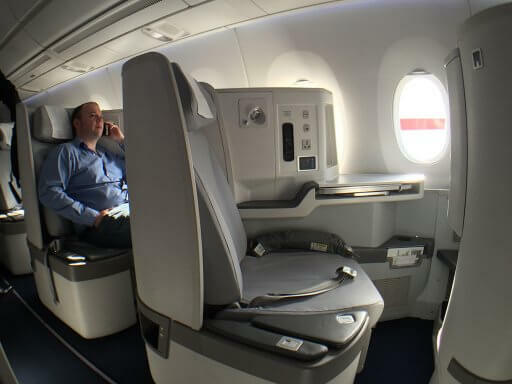 The sense of space is helped by the fact that there are no overhead lockers in the centre of the cabin. The lockers over the window seats are cleverly designed to hold a mountain of stuff and for suitcases to be stored on their side. 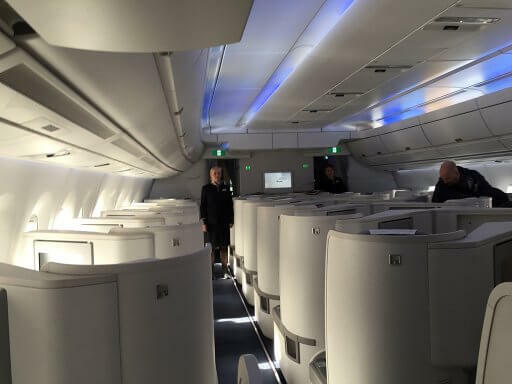 The Finnair A350 Business Class cabin is set out in a 1-2-1 reverse herringbone configuration so all seats have direct aisle access and plenty of room. 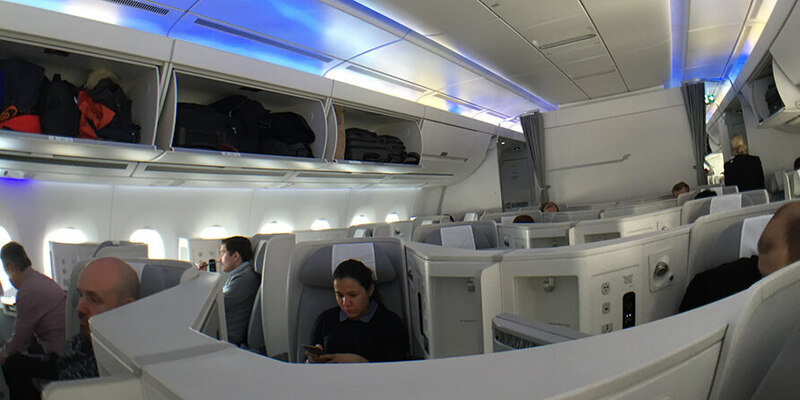 Direct aisle access is something that really should be a standard with premium seats and some of Finnair’s oneworld partners could do well to take note. 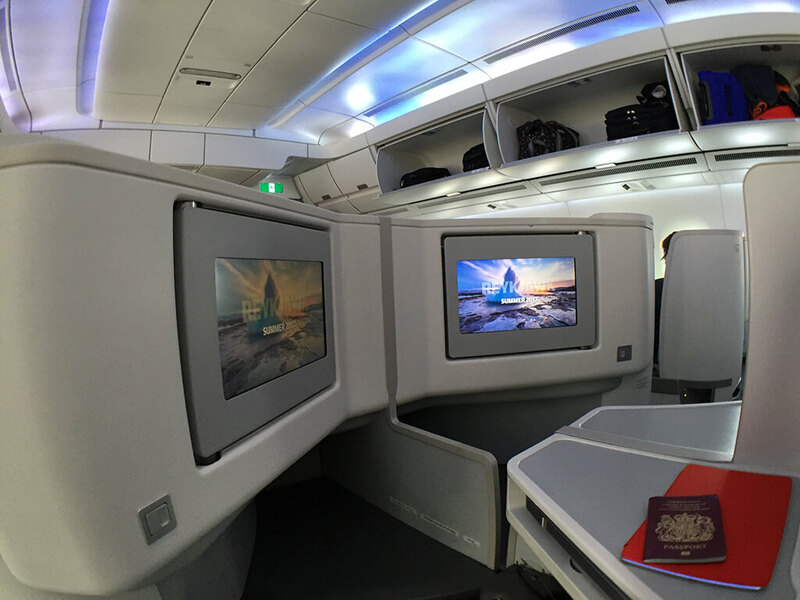 (Especially the one whose motto seems to be “to fly is to shove as many as we can in a premium cabin”). 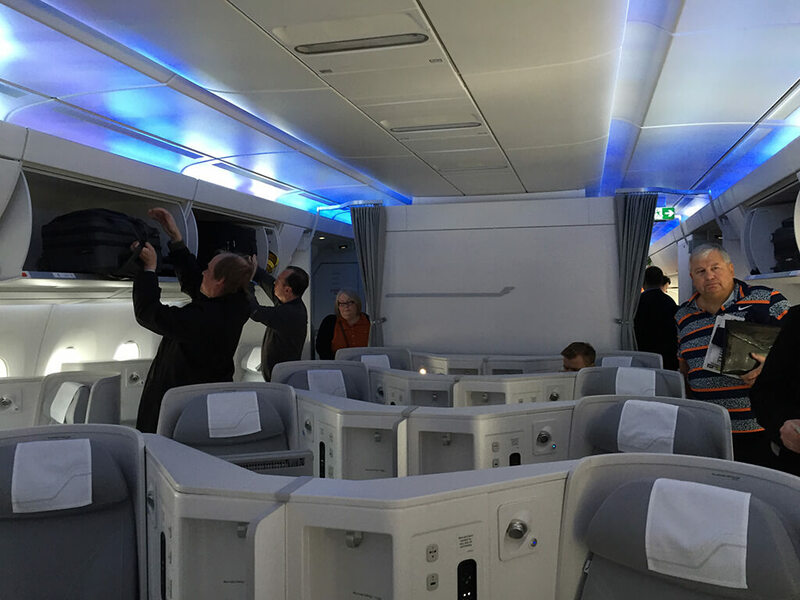 There are two configurations for the Finnair A350 Business Class cabin. The first layout has 8 rows, with a total of 32 seats. The plane that we were on was the other configuration, with an additional 4 rows behind the second galley. This layout has a total of 46 seats, with row 9 only having the 2 central seats. We were sat in seats 4D & 4H, which are the centre two seats. 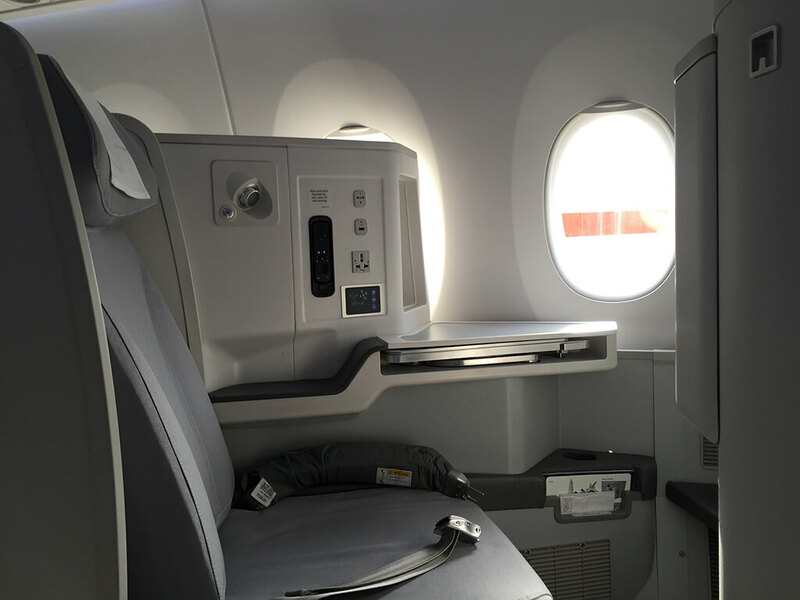 We had chosen the centre seats as we had read that they were the best choice for a two people flying together. First up, here are the technical bits. It is a Zodiac Cirrus III wide and long full-flat bed seat. The seats are 22 inches wide, with a pitch of 79 inches. Put another way, it’s fairly wide and you get a lot of leg room. Finnair used top Helsinki-based design firm dSign Vertti Kivi & Co to style the cabin interior. The colour scheme is fairly neutral, light, bright and very clean. The colouring helps to add to the sense of openness and space in the cabin. Another feature of the cabin is the lighting. Finnair has a total of 24 lighting schemes to change the mood in the cabin. 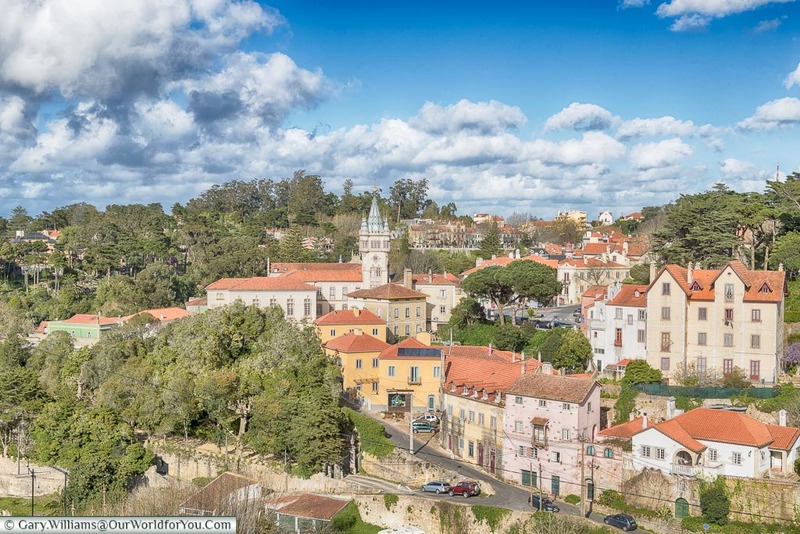 These range from warm sunset tones to clear blue Scandinavian skies. When I sat down, the first thing I noticed was that the seat was very well padded. 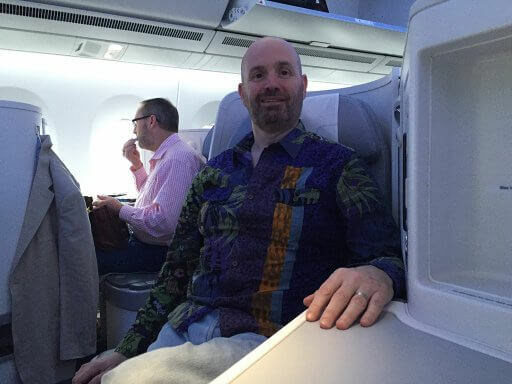 Certainly comfortable enough to sit in for the length of a decent long-haul flight. With plenty of leg room, you can stretch your legs out. You can place them on the padded ledge that forms the bottom end of the bed when the seat is fully flat. 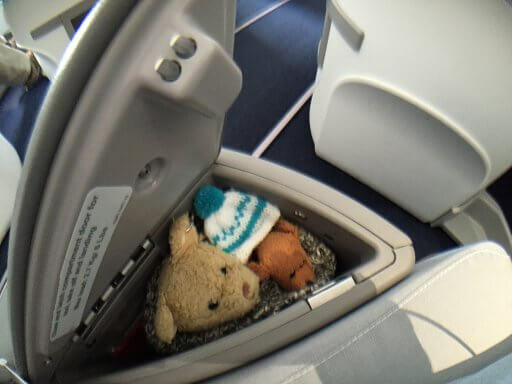 There is a small locker at the aisle side of the seat, which is handy for storing the bits and bobs you may need during the flight. The lid is padded and level with the seat when fully flat, adding more width to the bed. Adjusting the seat was easy, with a fairly simple set of control buttons. There is a holder for a water bottle and an aisle side armrest. 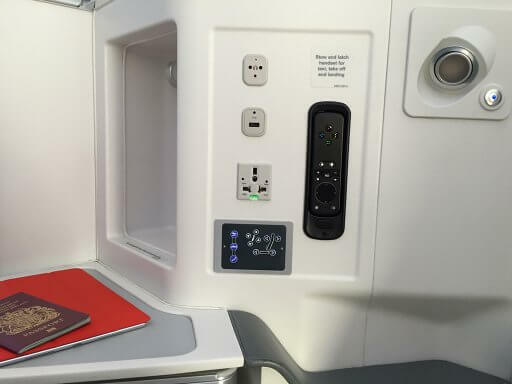 The seat has a small side table type ledge, where you can place your drinks without having to open the table. The table itself was stowed under this ledge and pulled out and the folded open. I thought that the table was a bit on the small side. Also, once you had it open it was in a fixed position, so if you wanted it closer to you, you had to move the seat. The way that the seat is designed, you get a good sense of privacy. There was, however, one downside to this. 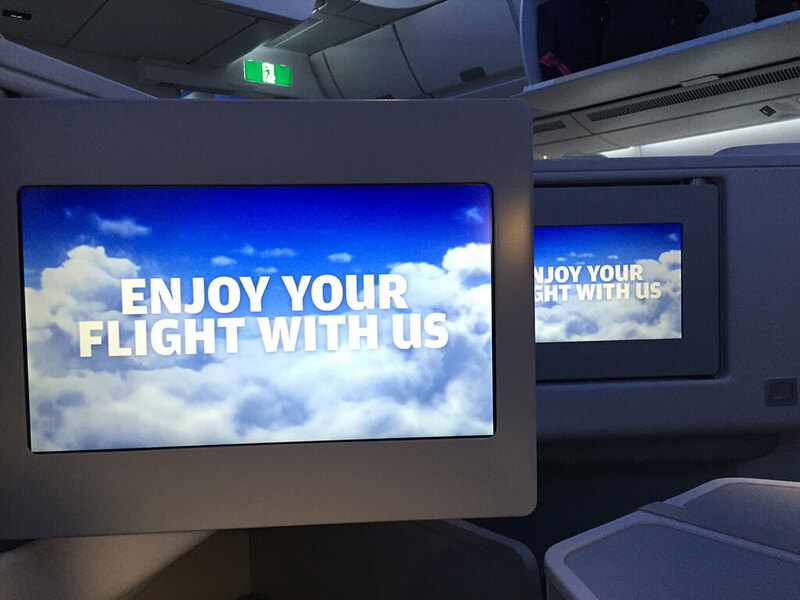 There is a fixed privacy screen between the two centre seats. What this meant was that in order to talk to one another Bart and I had to lean quite far forward and around the privacy screen. Only a fairly minor thing, but definitely something to be aware of if you’re travelling as a couple. In terms of at-seat power, there is an 110v socket and a USB port. The USB port didn’t have enough oomph to charge my iPad Pro but was good enough for charging an iPhone. The entertainment system has a 16″ HD touchscreen that’s remarkably responsive, which folds away into a housing unit. One of the things that surprised us was that we were told that it was fine to have the screen in the “out” position for take-off and landing. There is a remote control system, with a full alpha-numeric keypad on the back. The Finnair A350 Business Class cabin offers complimentary (yes, completely free) onboard WiFi, which is turned on twenty minutes after take-off. WiFi is available in economy, at a cost of €5 for an hour or €15 for the entire flight. An on-screen message tells you the URL to visit. Then you simply click the “connect” button and enter your surname and seat number. Once connected you have web access or you can enter the in-flight entertainment system. Bart had a problem connecting his iPhone to the WiFi, with the “connect” button being greyed out. However, I had no problem with connecting mine and both of us could connect our iPads. 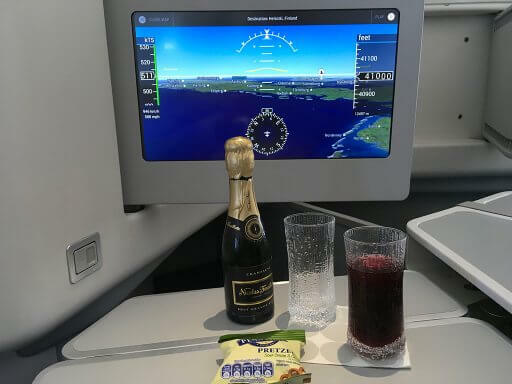 The new state-of-the-art Nordic Sky in-flight entertainment system was easy to use and offered a very good choice of films, TV series, music and games. As well as few old classics, there were same quite recent releases too. 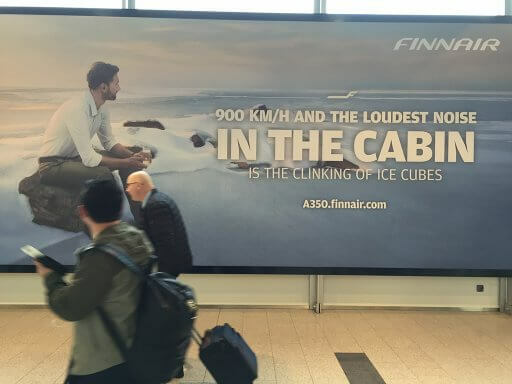 (According to the Finnair website there are 72 movies and 150 TV shows available). All the in-flight programmes begin with two adverts, but like YouTube ads, you can skip through them after a few seconds. Being on a short-haul flight we weren’t offered the Bose noise-cancelling headphones, but we did get some earbuds. 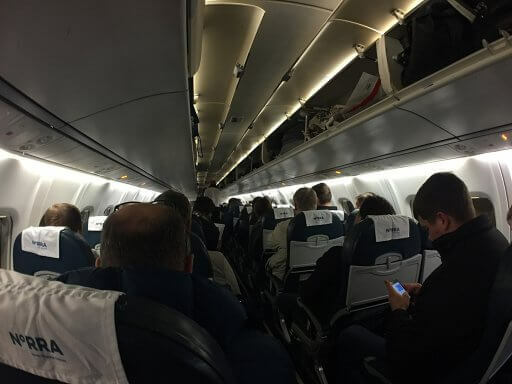 As we boarded the cabin crew were doing a good job ensuring that everyone settled in and was familiar with the seats. They offered newspapers, making one round with Finnish papers and another with English ones. At 10:16 I heard a “Cabin crew, boarding complete” announcement. 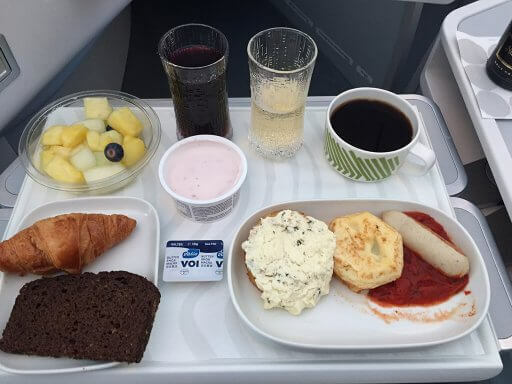 This was shortly followed by the captain’s “welcome to Finnair flight AY832…” speech. Scheduled departure was 10:20 and we started pushback 10:29. 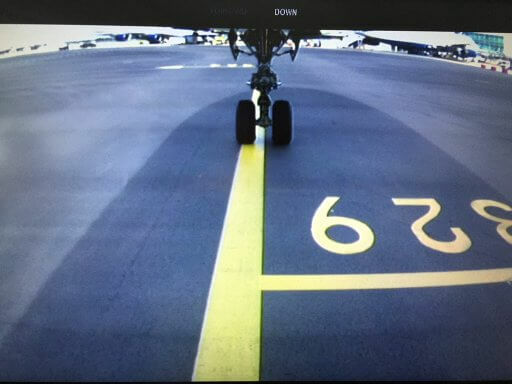 Just after pushback started they played the safety video, which whilst detailed wasn’t innovative. As is usual at Heathrow, there was a long wait to get on the runway, with us eventually pulling on to the runway at 10:55. 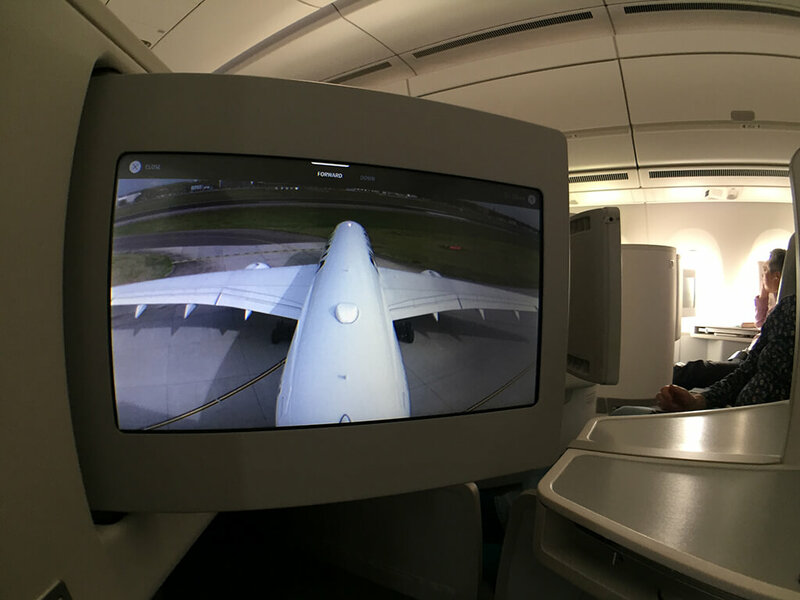 The A350 is equipped with two cameras, one on the tail and one on the undercarriage. This means that you get a great view of the take-off. (It’s especially if you have the undercarriage view on your seat screen while the tail camera is playing on the large screen at the front of the cabin). Bart got all excited watching the runway lines going by faster & faster and the wheels going up. (Okay, so I did too; I guess his AvGeekiness is rubbing off on me). By the time we had taken off, the cabin was already filled with the gorgeous aroma of warm bread. The captain switched off the fasten seatbelts sign just after 11:00. At about ten past eleven the cabin crew began to pass out the hot towels. These aren’t quite the thick fluffy Egyptian cotton of Qatar Airways. However, unlike another oneworld carrier, they are thick enough that you can’t read the in-flight magazine through them. 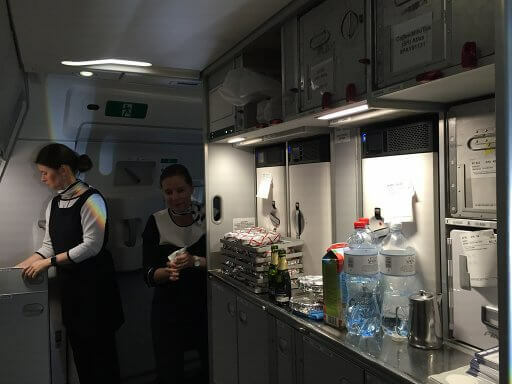 Hot towels were followed by the pre-meal drink service, which started from the front of the cabin. Bart and I both opted for a blueberry juice and of course, champagne. Finnair serves Nicholas Feuillatte Grande Réserve, a champagne with a light-yellow colour and delicate texture. The drinks were served in lovely elegant Ultimo Thule glassware, designed by Tapio Wirkkala in 1968. (His other works include the iconic 1970’s Finlandia Vodka bottle). Drinks were accompanied by a bag of Penn State Sour Cream & Chive Pretzels. Meal service was again front to back. We weren’t offered a choice, but what was served was seriously good. The starter was Lox, a smoked salmon dish, served with pickled red onion, which was both light and tasty. For the main course, we were treated to Beef and Chorizo Finnish Meatballs in a rich tomato sauce. These were accompanied by deliciously smooth and creamy mashed potatoes, fine green beans and carrots. The meatballs were scrumptious and packed with flavour. The vegetables complemented them perfectly. 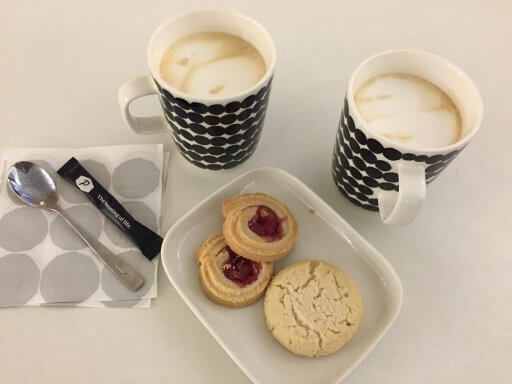 The Finnair Business class service features the exclusive Marimekko for Finnair collection of tableware and textiles. Dessert was a chocoholics dream; a richly decadent chocolate brownie, topped with a layer of chopped walnuts. It was just the right sticky consistency to ensure that each mouthful was a taste treat. It was sheer perfection when washed down with the champagne. 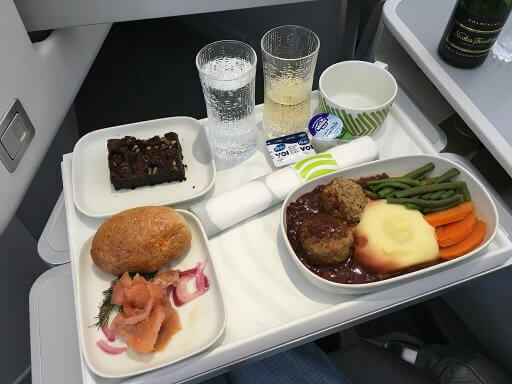 The meal service was unhurried and the cabin crew were attentive when it came down to clearing empty plates. 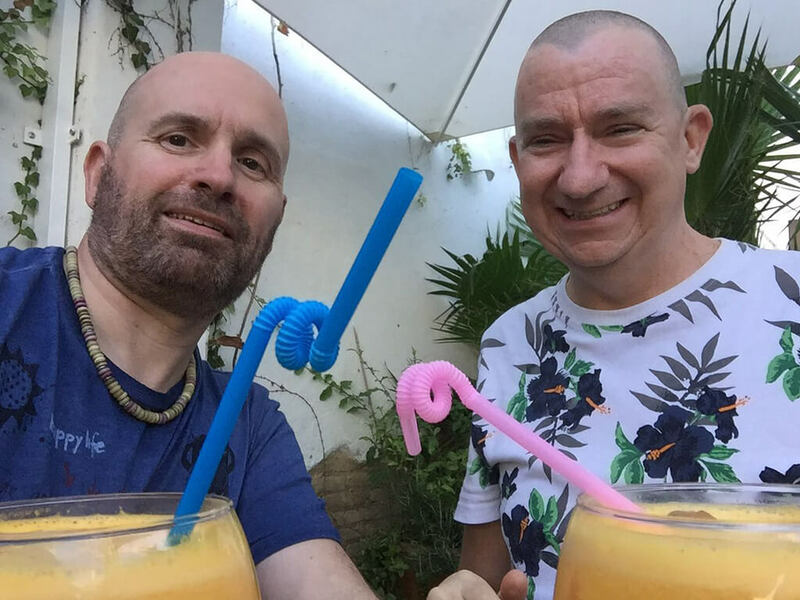 They were also very on the ball in offering more drinks, which is no bad thing. The rest of the flight seemed to go by too quickly and before we knew it, we were on approach to Helsinki. As we began our descent they played a video guide for transferring and immigration. 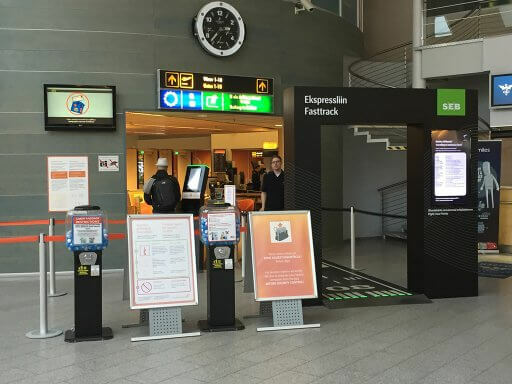 It was actually really useful and was actively promoting the use of the electronic passport gates. 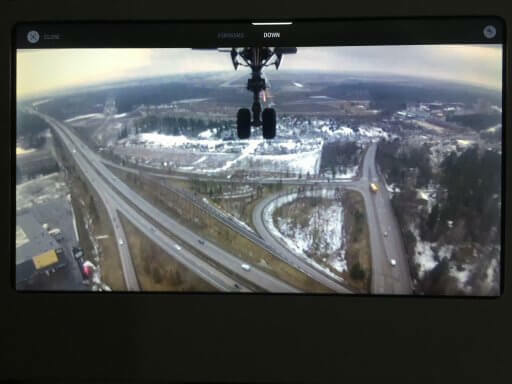 Watching the decent on the cameras we could see snow on the ground and the landing gear being deployed. Also, we got to watch the moment the wheels touched down at 15:10. After a short taxi, we arrived on stand at 15:15. 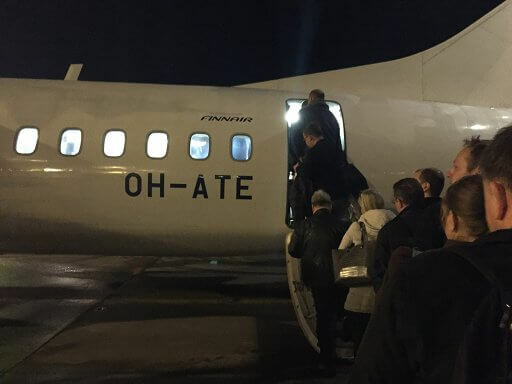 Unfortunately, due to enlargement and improvement works at the airport, we weren’t able to pull up to a gate with an airbridge and had to bus it to the terminal. We headed straight to the Finnair Lounge in the Non-Schengen area, which is located between gates 36 and 37. When we arrived the lounge was pretty packed, in part due to the flight cancellations caused by the industrial action. With four hours between flights, the lounge was a welcome place to relax and for Bart to make a few posts on Instagram. The time passed quickly, but by the time we left the lounge it was fairly quiet. Estonia is one of the Schengen states, so we needed to go through passport control. As we both have biometric passports, we used the electronic passport machines. I’m not sure how many there are (the airport website just says dozens and we forgot to count), but they were all working. 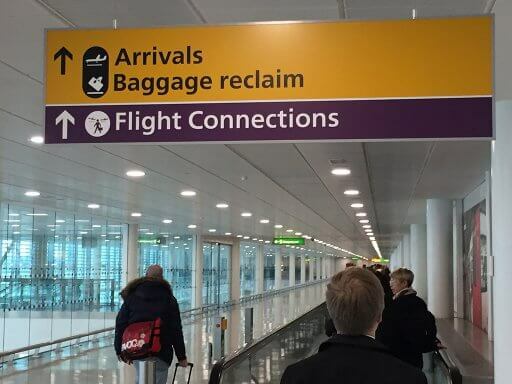 It may just be my opinion, but they seemed a lot quicker than the ones at Heathrow. Once we arrived at the gate, it was time for another bus ride to the plane. Arriving at the plane we wished that we had been able to check the bags through to Tallinn. The ATR72 used on the route is a pretty compact plane with a very limited amount of locker space. The flight length is officially 35 minutes, though in reality is just under 25. I felt that no sooner had we taken off than we were descending into Tallinn. Lennart Meri airport in Tallinn is small but perfectly formed, with all the gates beautifully themed and decorated. Being a compact airport we in a taxi and on our way to the Hilton Tallinn Park for our 2-night stay. 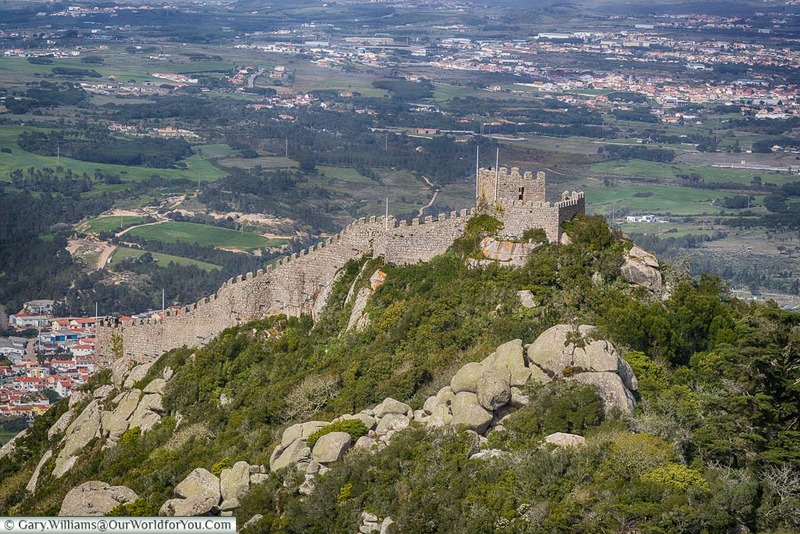 The 2 days flashed by and we were back at the airport for our return flight on the ATR 72. 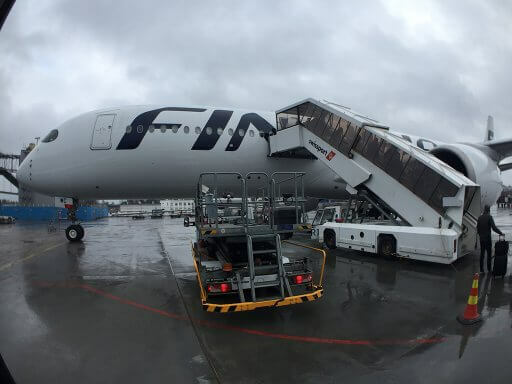 We checked in using the Finnair app, which, like the web check-in was a smooth and painless experience. We had an overnight stay in Helsinki, so we checked our bags for the flight, which saved us the angst of having to stow them on the plane. The most difficult thing was finding the Finnair check-in desk, which we only spotted because I saw the hand baggage measuring thingy. 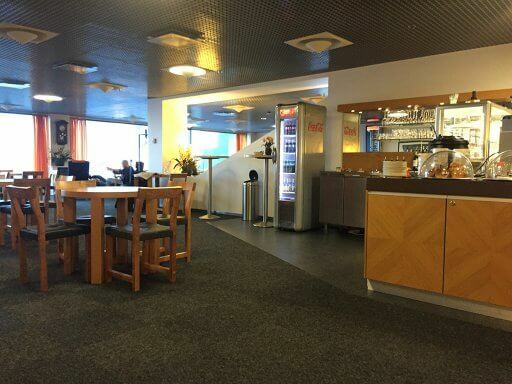 Tallinn airport was quiet when we arrived and we were through security in a flash. Interestingly, both of us set off the scanners, but all they did was swab our hands – no pat-down search. 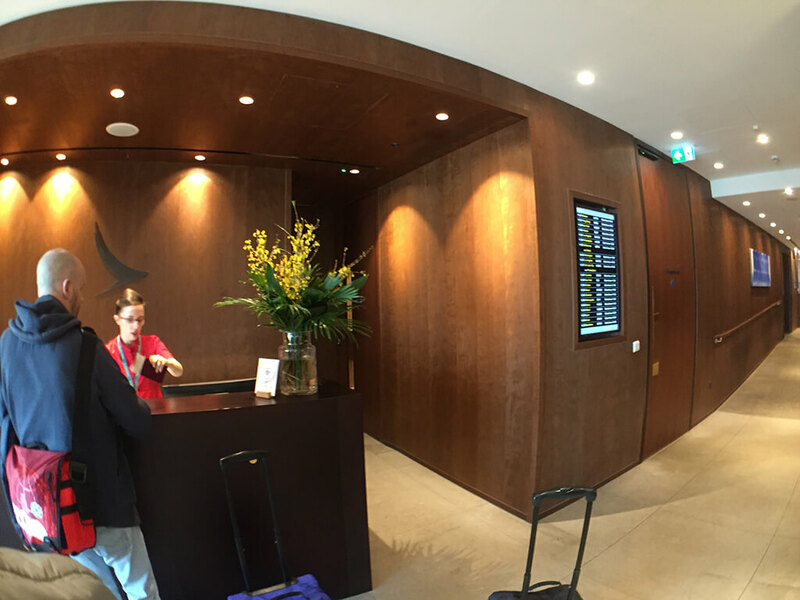 After spending a little while taking a look around the terminal, we headed up to the Business Lounge. For a small airport, it was an impressive lounge and better than some airline’s own lounges I can think of. A few glasses of wine later we back on the plane and touching down in Helsinki again. The bags came out quickly. As we disembarked we noticed that the baggage handlers were separating the priority tagged luggage and for a change they were the first cases on the belt. 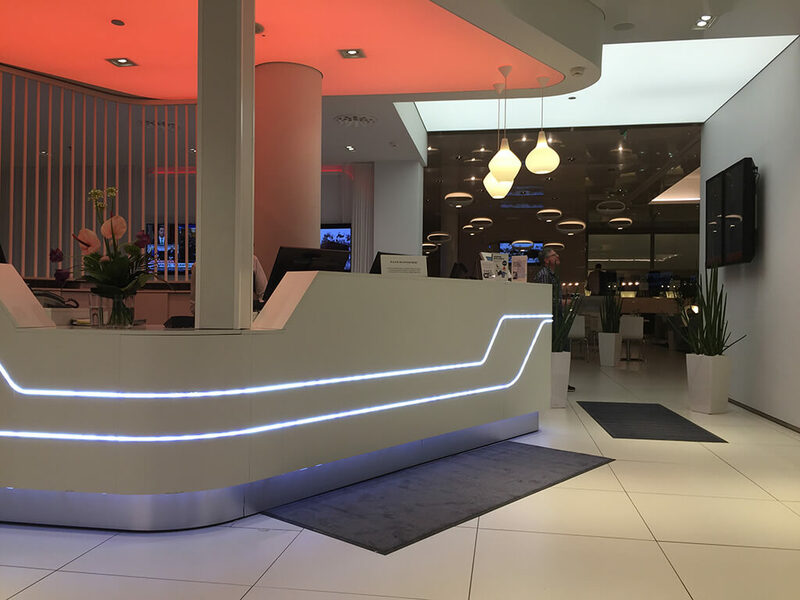 A five-minute stroll later and we were at the Hilton Helsinki Airport for our overnight stay. After a good night’s sleep, we had to get up early, as boarding was due to start at 07:20. Again, we had access to fast track security. However, we did have a hard time finding it. The signage directed us towards the main security gate. On the end of the sign above the entrance to security was an arrow indicating that fast track security was to the right. Heading right led us towards a wall. In the end, Bart asked one of the security officers who told us that we had to turn around, head back towards the door and then go up the escalator. 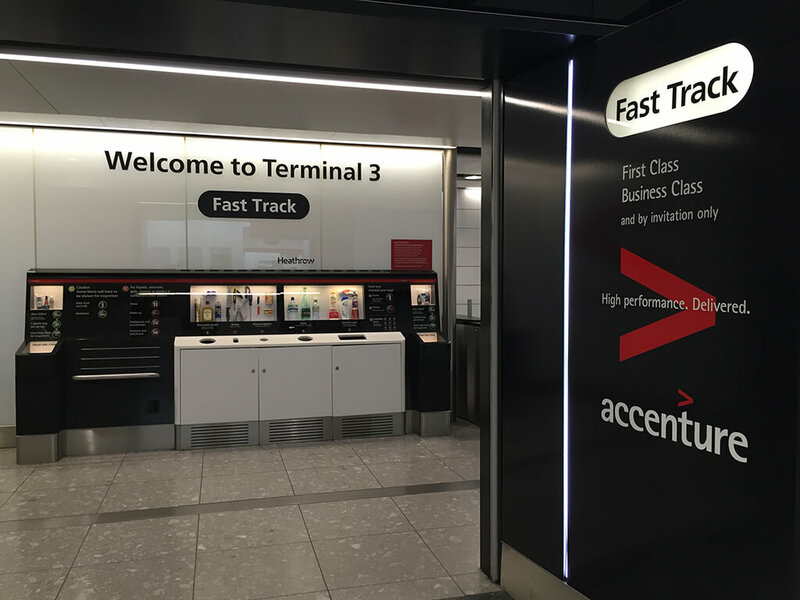 Eventually, we found the fast track and were very soon airside. After security, we headed straight through passport control (again lots of open passport machines) and on to the Finnair Lounge for coffee. 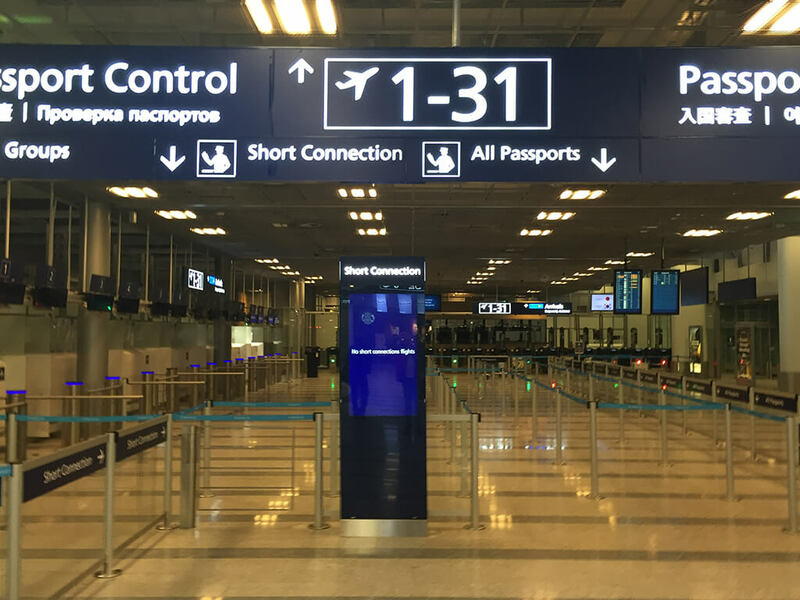 One of the things we found handy while we were waiting was that the Finnair app had a countdown to boarding, helping to ensure that people got to the gate on time. At the gate, there were four embarkation points, one of which was marked Business and Priority. However, when they began boarding 07:25 it was by groups again and it didn’t matter which queue you joined. People tried to rush forward to beat the system and board with group 1, but they quite unceremoniously sent back to wait their turn. 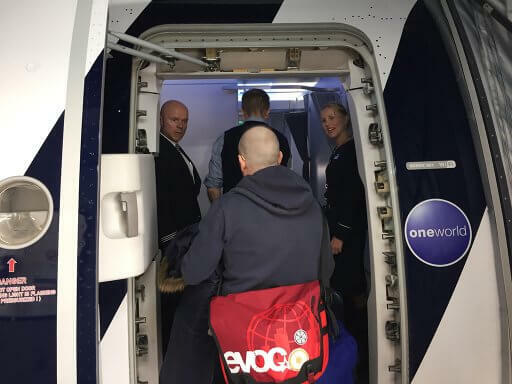 As we boarded, once again there was a warm welcome and cabin crew were on hand to help people settle in. 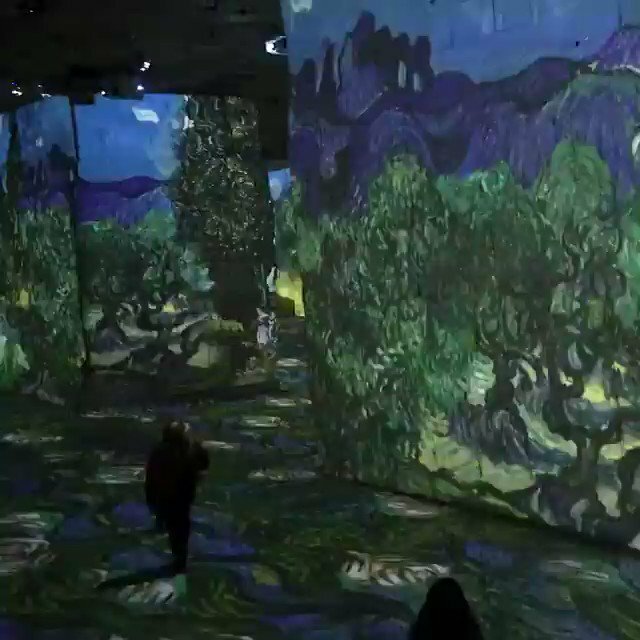 Bart and I were in 3D and 3H this time. 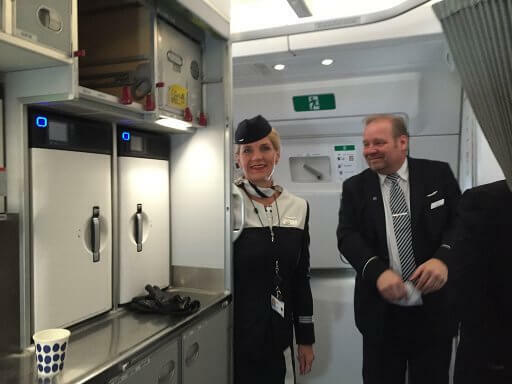 The flight attendant on Bart’s side was asking people if it was their first flight in the Finnair A350 Business Class cabin. Again, like on the outbound flight, she explained the seat features to first-timers. She was also telling people to stow their cases on their side, to make the best room of the space in the lockers. With boarding complete at 07:55, the doors were closed before eight and after the captain’s welcome, we began pushback at 08:04. Following the flight safety video, the hot towels came around and breakfast service started at 08:40. As on the outbound, service was front to back. As on the outbound, there was no choice of meal. The hot breakfast consisted of a tasty sausage in a tomato sauce, a mini omelette (cooked to perfection) and hash brownies with a cream cheese topping. There was also a fruit salad of melon, pineapple & blueberries and creamy yoghurt. We were offered a selection of hot rolls and croissants to go with the meal. Bart and I washed the meal down with some juice and a drop of the Nicholas Feuillatte Grande Réserve champagne. 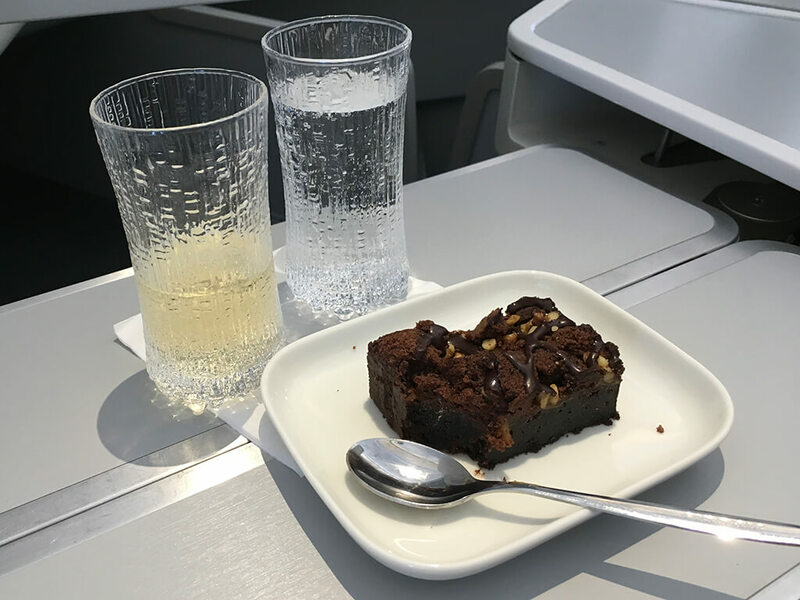 (A bit decadent with breakfast on a school day, but when you’re in business class it would be rude not to). Again, like on the outbound, the meal service was unhurried. After breakfast people mainly settled down, with many having a snooze for the rest of the flight. When I stood up to pop to the loo, I noticed a few people taking full advantage of the flat-bed seats. In all honesty, having tested out the flat position, I would have done the same if I wanted a doze. The loos deserve a bit of a mention. While not massive, they are well appointed. 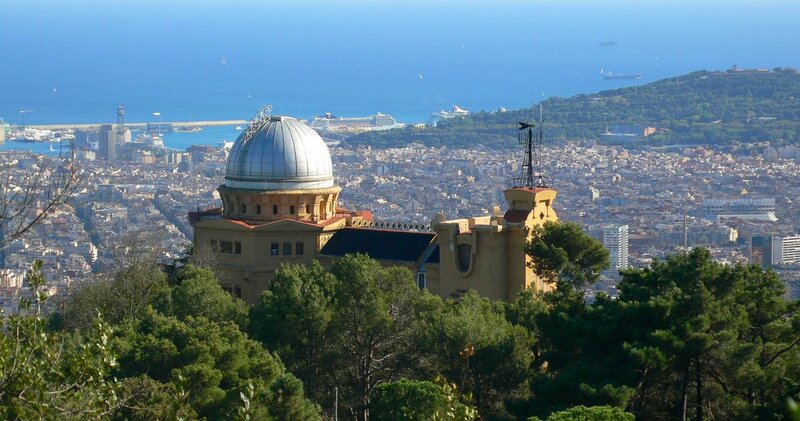 We were quite impressed by the fact that they are loos with views. 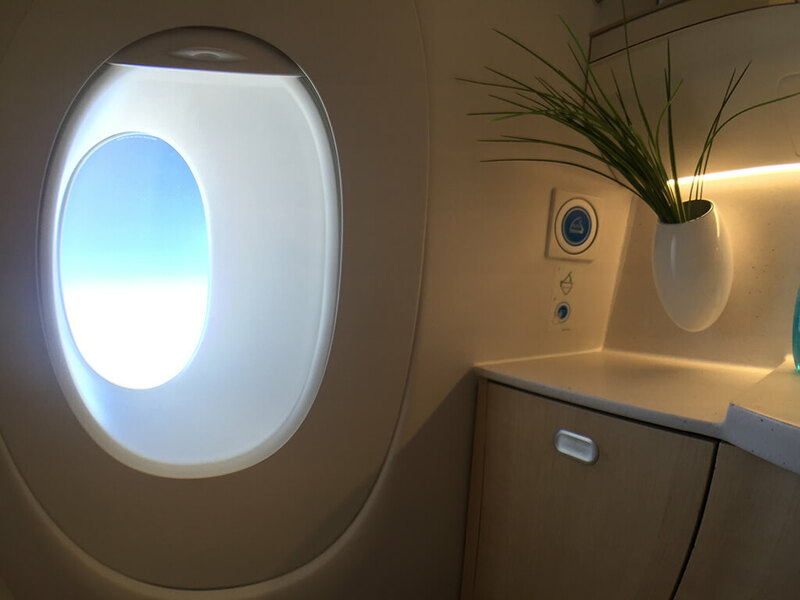 Yes, there is even one of the A350’s panoramic windows in the toilet. However, for those worried about peeping toms, it is complete with a window blind. 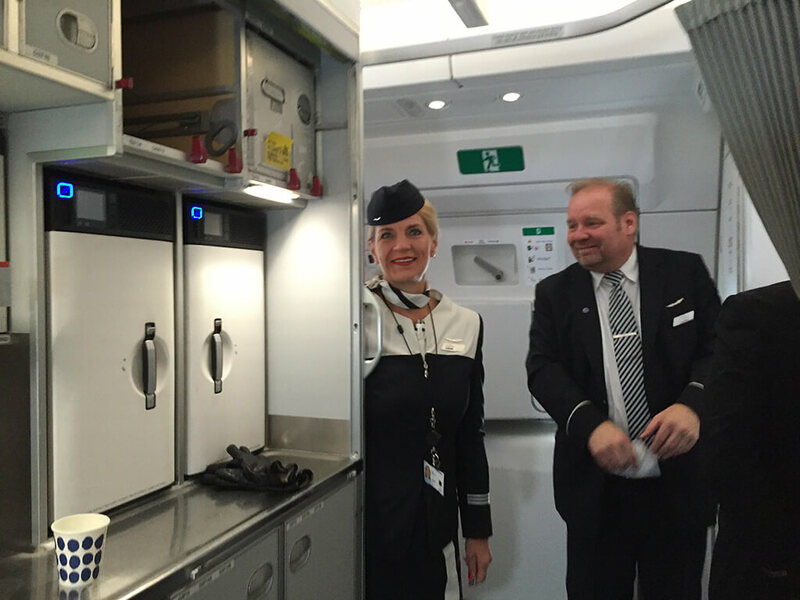 During the flight, Bart popped into the galley for a nose around and had a chat with some of the cabin crew. They told him that they liked working on the A350, particularly as the galley was so spacious that it made meal service significantly easier for them. Time flew by and before we knew it we were on approach to Heathrow. Once again, we watched touchdown on the cameras. We touched down 08:58 and were at the gate just before the scheduled arrival time of 09:10. 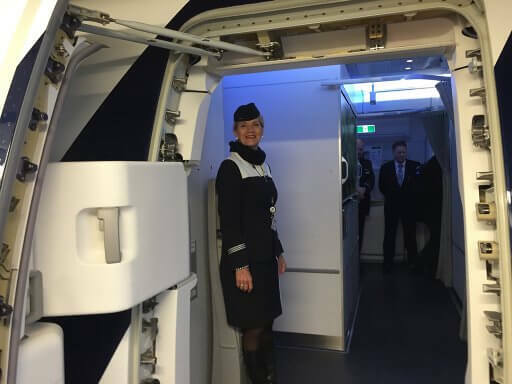 We began to disembark almost straight away and our wonderful experience of flying in the Finnair A350 Business Class cabin came to an end. Of course, with Heathrow being the sprawling edifice that it is, it was a hike to get to passport control. We joined the long queue for the electronic passport gates. Annoyingly, only 3 of the 15 gates were in use. A total contrast to the situation at Helsinki. Eventually, we got through passport control. 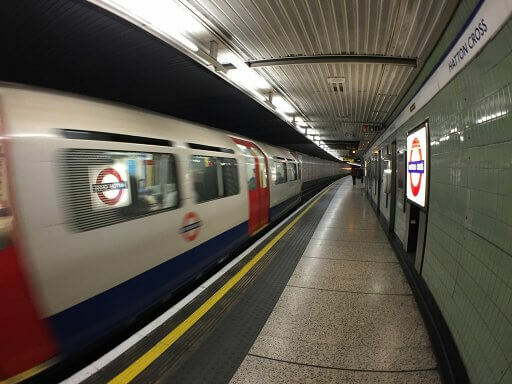 Having taken our bags on board, we were able to head straight to the tube station to head for home. 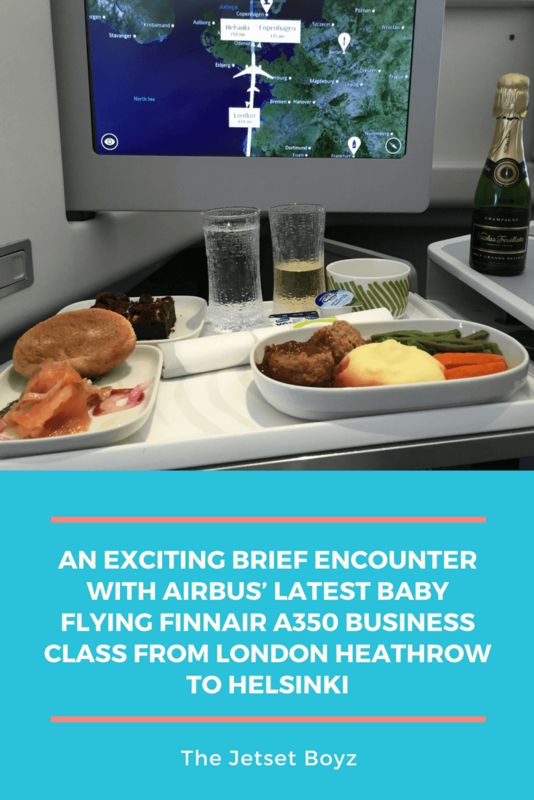 We had a great time giving the Finnair A350 Business Class seat a test drive. Finnair has a fantastic network for connecting to Asian destinations and has some of the shortest flying times to reach them from Europe. (They are the only European carrier to fly straight over the North Pole). 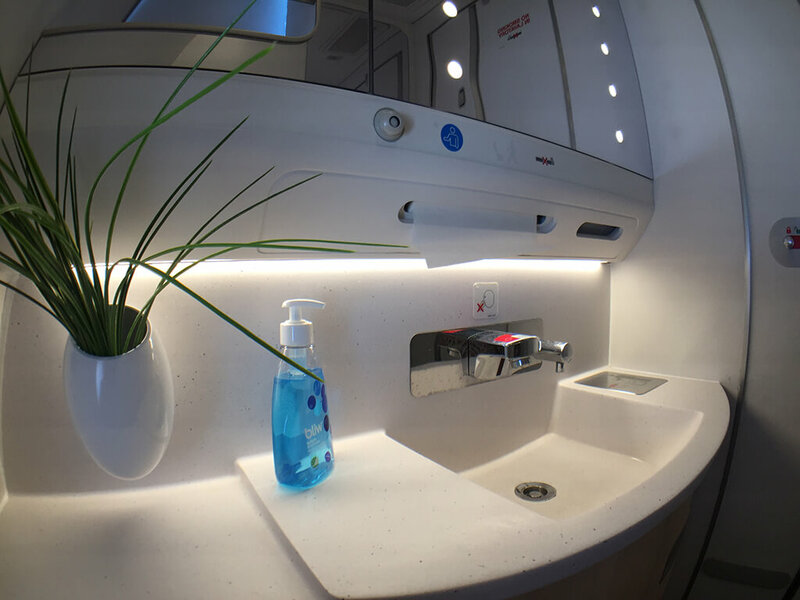 Having experienced their short-haul business class product, we’re now keen to try the full experience on a long-haul trip. Roll on the next Finnair business class sale!! 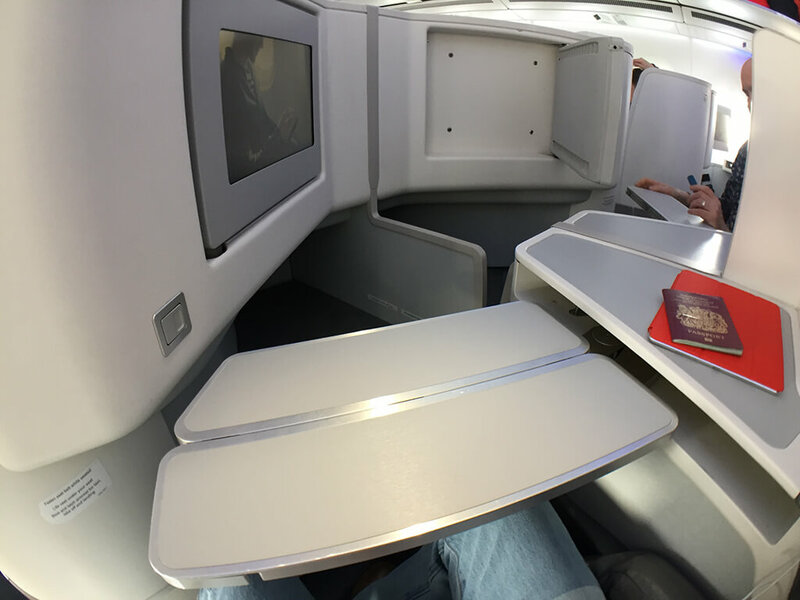 I love this – really informative and I think it’s great that you can get a flat bed on a 3-hour flight! Thanks, Catherine, glad you enjoyed the article. Yep, the flatbed on a short flight is perfect if you want a quick snooze. You can also enjoy a flatbed on LAN’s Dreamliner from Madrid to Frankfurt (2 hours 35 minutes), Air China’s A330 from Barcelona to Vienna (2 hours 15 min) and Singapore Airlines’ A350 from Stockholm to Moscow (2 hours 5 min). Plenty of opportunities to experience long-haul napping at short-haul prices.